So I've been practicing a ton on the English horn. It's fun. I have to say, I think oboists have the best auxiliary instrument in the orchestra - flutes have to play piccolo which hurts the ears, clarinets and bassoons have really heavy things to carry when they double on their auxiliaries - except for the Eb clarinet, which is just silly. And as I was practicing away I started to really struggle. The low register just wasn't speaking well. So I readjusted. 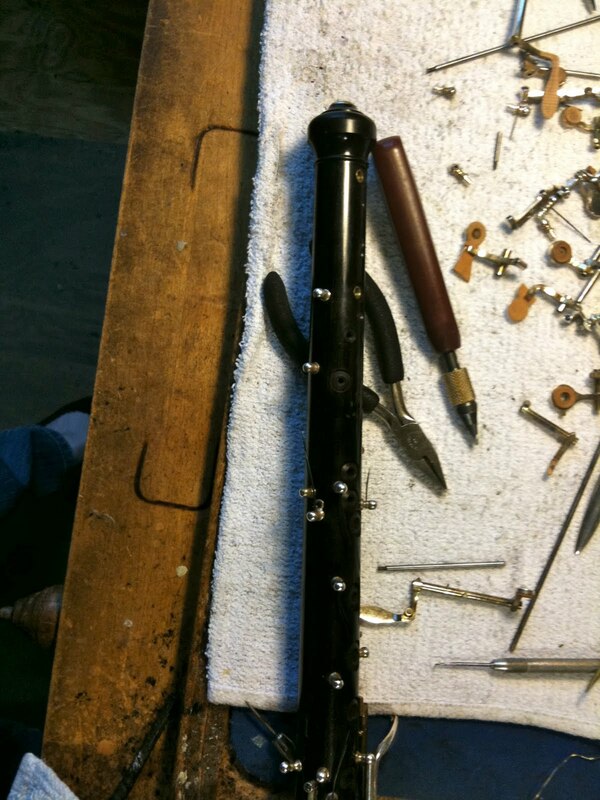 All of those crazy little tiny screws on the instrument regulate the keys and pads and their relationships to each other, and members of the oboe family are notoriously finicky about well, everything. Changes in temperature or humidity, moisture touching the pads, someone looking at them sideways - it's easy to mess up those little adjustments. So I fixed it, and things were okay again. I went to my Tuesday recording session, and there were only a few bars of EH, but again I was struggling. The attacks weren't quite right, and the intonation was getting funny, too. I changed reeds, and things were only a little better. I scraped the bejesus out of that reed, and got through the job. The next day I was practicing again, and when I went to check the adjustments AGAIN I saw this. Now it all made sense - and I panicked. I had almost no time off, my English horn had a five inch crack and was therefore unreliable if not technically unplayable, and I was playing for OPRAH and THE MILWAUKEE SYMPHONY and TAKING AN ENGLISH HORN AUDITION all in the next 10 days. Wooden instruments crack all the time. Usually new instruments, not trusty 15-year-old English horns, but it happens. I have never had an oboe that didn't crack, and it's not usually a huge issue. 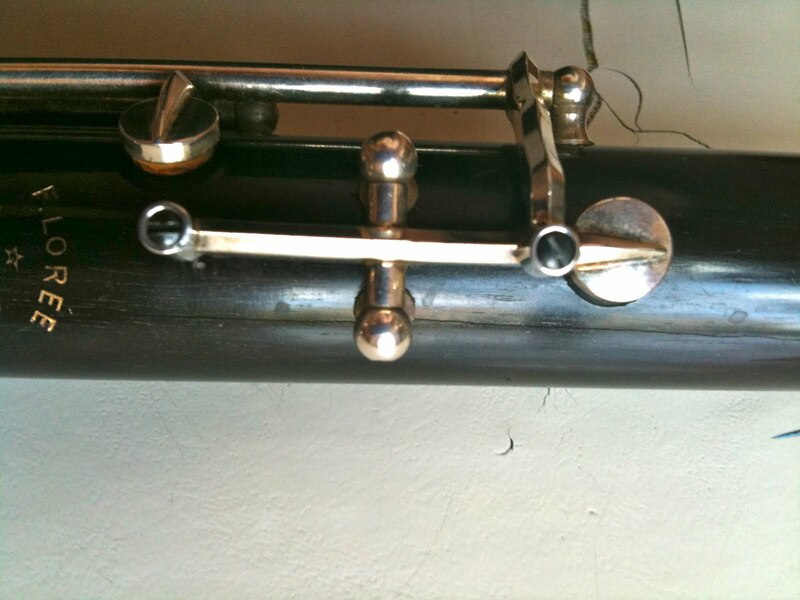 I send it off, it is stabilized and pinned and polished, and it comes back as good as new. Better, in some ways - the sound can really open up and once it has cracked and been repaired it is less likely to crack again. But when my oboe cracks I can just play on my other one during the repair. I don't have a spare English horn - how many dang instruments do I have to keep on hand? Soooo. I called Carlos Coelho, my WONDERFUL repairman, and set an appointment. I called a good friend and colleague and with her customary generosity she loaned me her lovely new English horn which I played and practiced on for several days. I drove down to Indianapolis at the crack of dawn for my repair and returned the same day, just in time to meet my students. Actually, I would have been a little late if the first one hadn't called in sick - THAT'S how tight that day was. Ultimately I got through everything just fine. But that feeling of momentary desperation was an intense reminder that you can NEVER trust an oboe. It's just looking for a way to let you down. If it's not the reeds, it's the adjustments, and if it's not those then it's the beautiful expensive wood itself. My profession has its personal frustrations, certainly - labor struggles, good gigs that pass me by, absurdly late nights driving home from distant cities and discouragingly low wages - but few aspects of my life are as infuriating as the instrument itself. Which, absurdly, is why I love it.